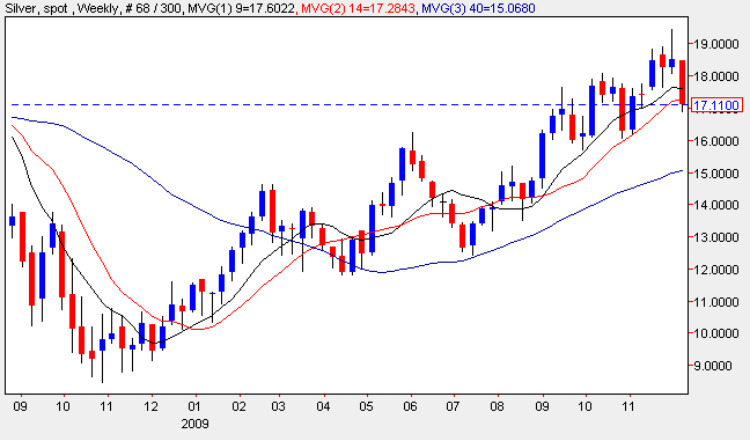 Spot price silver too followed the gold market lower last week ending the weekly silver trading session with a wide spread down bar which closed below both the 9 and 14 week moving averages. This candle confirmed the strong bearish signal of the previous week where we saw a deep shooting star which first indicated potential weakness for spot price silver, and indeed the same technical pattern has been repeated for spot gold on the weekly chart. Technically the weekly silver chart now looks increasingly bearish in the short term although there is potentially strong support at the 16.50 per ounce level which should provide the necessary platform for an eventual reversal in due course. However, the breach of the 14 week average does not bode well for silver prices in the short term and until we see a reversal signal such as a long legged doji or a deep hammer we should expect to see a further fall in silver prices. Longer term the picture remains more positive with the recent bullish trend created from January 2009 still setting the tone and for this to resume we need to see a break and hold above the $19.00 per ounce region and once this has been achieved then silver prices should continue higher to their next level at $21.00 per ounce.